A harsh convo with a doctor made Max choose between a future of sickness and disease, or the hard-fought road to fitness. He made the hard choice to NOT be obese. Being a junior in high school I reached the point where I was tired of being overweight and overlooked by many. I wanted to make a change in my body both physically and mentally. Throughout my childhood, I was always the big kid who got winded doing any type of physical activity. I would participate in sports but I could never achieve a starting role; rather, I was relegated to a supporting member due to my lack of endurance because of my weight. Needless to say my body image affected my daily performance and my own perspective of how I viewed myself and how I came across others. Every time I came across a built kid I would get jealous. I would envy the attention they got from others and pictured myself in their shoes. It didn't help the fact that every male in my family was in good shape and I was the most out-of-shape. My social life was also affected because of my weight; I could never build up the courage to talk to people because I was always worried about what they thought and how they would perceive me. Being overweight, I was always self-conscious and would never engage in any social activities. I kept to myself and to my closest friends that never judged me for my shape. The breaking point came when I went to the doctor for my yearly physical. It was explained to my parents and me that I was obese. My doctor said that I would face a lifetime of health issues if I did not do something immediately to correct the situation. 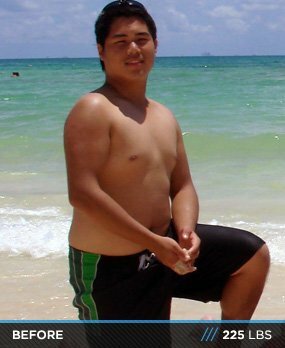 Sitting there and hearing the word "obese" and having to see the look of horror on my parent's face made me realize that I had to make a drastic change in my life. I vowed from that moment on that I would do something about my weight. After my visit with the doctor, my parents suggested that I exercise more. I listened and started to do push-ups and sit-ups every night. I would also run around my neighborhood and on the treadmill whenever I could. Eventually I started to see a little change in my body but nothing crazy. I wasn't satisfied and wanted to see more change so I asked my parents if I could sign up at the local gym. They didn't hesitate one second and were more than happy to sign me up. Picking up weights for the first time at the gym was a combination of both terror and excitement. I was excited that I was now in the process of transforming myself but questioned if I was doing it right. At first I had no idea what I was doing, I had a little sense of what to do from lifting weights for football but it was not enough. Thus began countless hours of researching, reading, and watching videos and articles on everything from nutrition/diet to proper workout techniques. 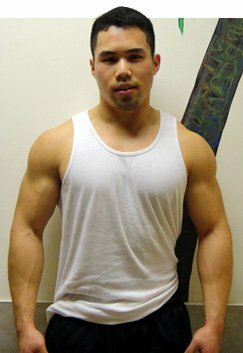 The articles and teen bodybuilder of the week profiles on bodybuilding.com really helped jump start my transformation. I immersed myself into this world of health & fitness and was slowly drawn into this new obsession. Now that I'm more experienced and know a lot more about working out, I don't waste a second at the gym. From the time that I step into the gym to the time I step out I'm focused on one thing and that's to work hard. I've learned a lot these past couple of years and the most important thing I've learned is that results comes with hard work and patience. You can't change your body overnight; it takes proper diet/nutrition, hard work, dedication, motivation and countless hours at the gym to get to where you want to be. If you want your body to grow and be ready for the next hard workout you throw at it, then supplements are a must along with proper diet/nutrition. Knowing what supplements to take and what they're intended to do will maximize your results and do your body wonders. But understand supplements are there to help your body grow and recover; they won't do all the work for you. I'm sure many have heard that diet is the number one workout for your body but this is very true. If you spend hours at the gym and your workout is top notch, your diet/nutrition has to be on par and strict to see the cleanest gains. Every person's body reacts differently, so it is up to you to find what works and build upon it to get to where you want to be. It is also very important to understand that good form helps the muscles grow. It doesn't matter about the amount of weight you can do, without quality form your muscles won't grow ideally. One should always remember whenever working out, quality over quantity. Change for yourself and no one else; do it because you want to. You should never let anyone or anything change the way you are, unless you want to change for yourself. No one likes being told what to do so don't go and do something that you don't want to. Take a moment and think to yourself, "Is this what I really want to do?" And if so, find a reason to motivate yourself to keep on going. Find a reason to wake up every morning, looking forward to going to the gym. I've found my reason to transform myself and will always be motivated and dedicated to working out. Now go and find your own. Also, like Phil Heath (newly crowned Mr. Olympia) said, "You should always kill it at the gym, but at the same time don't kill yourself." I just want to say thank you to my parents and closest friends who have been with me throughout my transformation from the very beginning. Without the love and support from my family and friends, I know I would not be where I am today. I especially owe my mom a huge proportion of my success because she has done so many things to help me along my transformation. She has learned healthier ways of cooking, bought healthy snacks and food, and really understands my new healthy lifestyle. I also owe my best friend, Thomas, a huge part of my success because he was the one who has helped me the most along the way. He's been there since the first day of my transformation, being my workout partner and always pushing me to do more. I know that I am surrounded by people who will always support me and help me along the way. For that I am thankful.